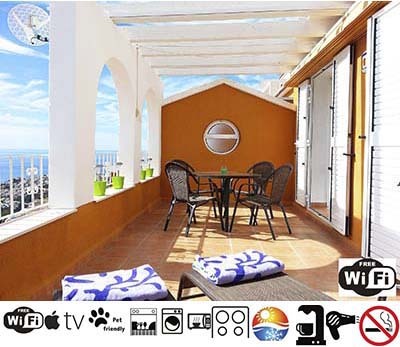 The apartment has 69 m2 and a 20 m2 large terrace with breathtaking 180º panoramic views of the sea. 1 spacious living / dining room furnished with a dining table and chairs , sofa and a coffee table. Full equiped cot & Baby chair available on request. 2 bedrooms with spacious wardrobes and very comfortable mattresses : 1 bedroom with double bed of 160×200 and direct access to the terrace, and 1 bedroom with 2 beds of 80×200. Bed linens provided. living room and main bedroom have patio doors opening onto the terrace furnished with an awning, patio table and chairs, parasol and 2 sun loungers. Kitchen with dishwasher, microwave, ceramic hob, oven, coffee machine, toaster, kettle, electric juicer, fridge and freezer. Washing Machine, iron & ironing board. 1 bathroom with bathtub, hairdryer and towels. Community pool on 2 levels overlooking the Mediterranean. Pool towels provided. Own parking on private street.